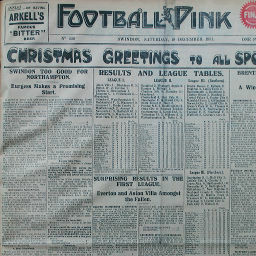 Elected to the Southern League in 1901, Northampton joined the League as Swindon were at their lowest ebb - after beating the Town 3-1 at the County Ground in the clubs' first ever encounter, the Cobblers humiliated them further in the return fixture, winning by eight goals to nil, with former Town player Herbert Chapman scoring twice. After a spell at Tottenham, Chapman returned to Northampton to start his managerial career in 1907 - and he quickly turned them around from finishing bottom in the season before he joined, to champions in 1909, finishing six points ahead of the Town, who had also experienced an upturn in fortunes since the first meetings, to finish in second place. 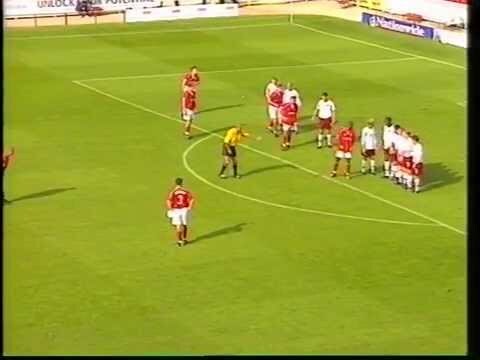 Two seasons later, the roles were reversed - Swindon winning their first championship, five points clear of the Cobblers. 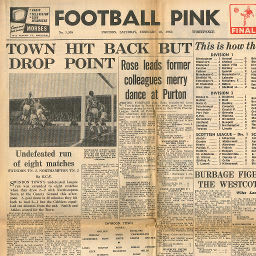 Northampton played a part in the Town's first ever relegation, in 1964/65 - going into the final day of the season, Swindon and Portsmouth were tied on 33 points at the bottom of the table, and Northampton were already assured of promotion to Division One, though providing other results went their way, they still had a chance of winning the championship. Pompey had to travel to Northampton on the final day - but bizarrely, the kick-off was scheduled for the evening - Swindon meanwhile had to travel to Southampton to try to save themselves from the drop. 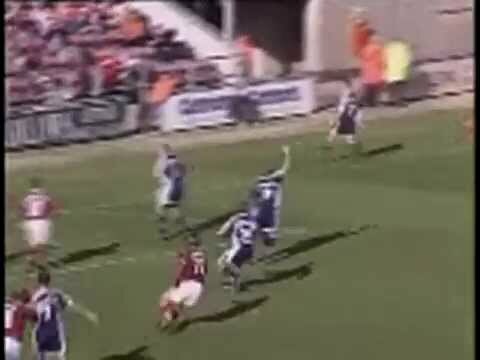 When the Town lost 2-1 at the Dell, and with Newcastle sealing the championship earlier in the day, Portsmouth knew they only needed a point to avoid relegation themselves, and Northampton now had nothing to play for. The two sides played out a 1-1 draw, and the Town dropped back down to the third tier, two years after their first promotion. 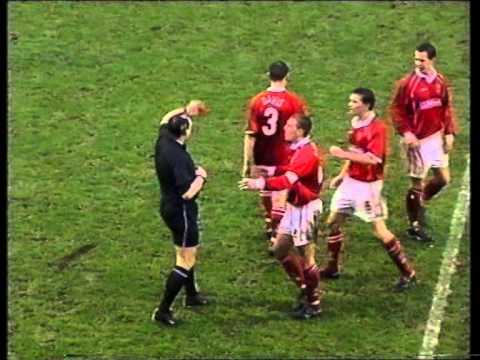 Both teams are booed off the pitch after a drab goalless draw. Days after his sacking, and after protests by supporters and players, Lou Macari is reinstated as Town boss. Gary Alexander's goal gives Swindon a vital win at Northampton. The Town draw 1-1 at Northampton, after Giuliano Grazioli gives them the lead shortly after the break. "Gabbiadini is a horse's arse", so the song goes. With the home crowd turning on boss Andy King after an awful run of defeats, Swindon finally register a victory, thanks to a goal from Johnnie Jackson, a Sam Parkin penalty, and Cobblers' keeper Lee Harper's red card. 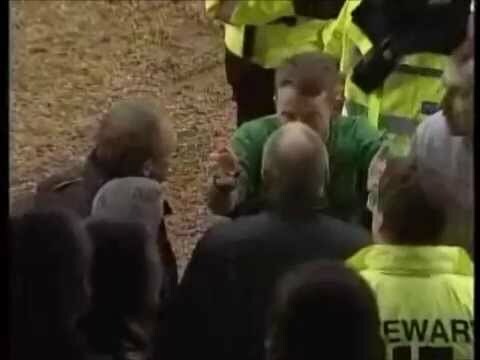 Andy King almost comes to blows with Northampton caretaker manager Martin Wilkinson, as his side goes down to the relegation threatened Cobblers. A Christian Roberts penalty gives Swindon a point on the opening day of the season. Adebayo Akinfenwa's goal three minutes from time denies Swindon victory after Blair Sturrock's opener. Swindon are fortunate to end their run of seven games without a win - Paynter and Cox netting in a 2-1 victory over the Cobblers. Simon Cox nets his third hat-trick of the campaign - and whereas the other two games end in draws, this one nets a crucial 4-3 win over Northampton in a superbly entertaining clash. 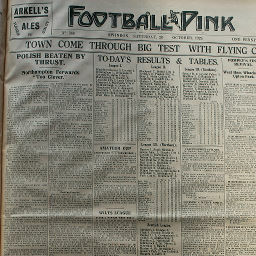 Click to view a newspaper report of Swindon's 1-1 draw at Northampton Town in the 1928-1929 season. 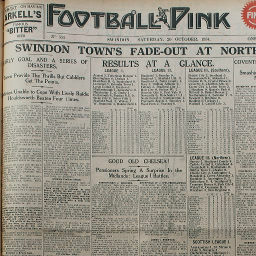 Click to view a newspaper report of Swindon's 2-0 win against Northampton Town in the 1929-1930 season. 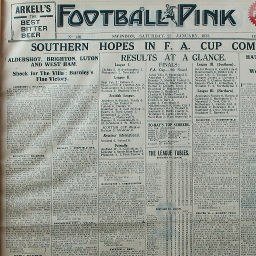 Click to view a newspaper report of Swindon's 3-3 draw at Northampton Town in the 1929-1930 season. 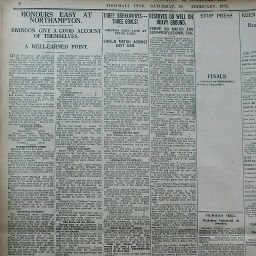 Click to view a newspaper report of Swindon's 0-3 defeat at Northampton Town in the 1930-1931 season. 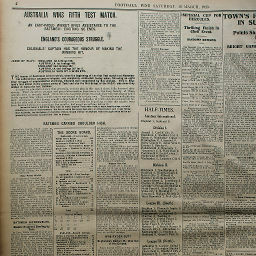 Click to view a newspaper report of Swindon's 5-1 win against Northampton Town in the 1930-1931 season. 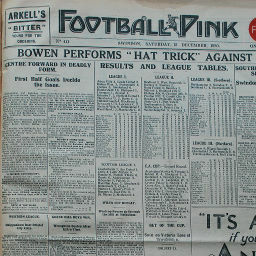 Click to view a newspaper report of Swindon's 3-0 win against Northampton Town in the 1931-1932 season. 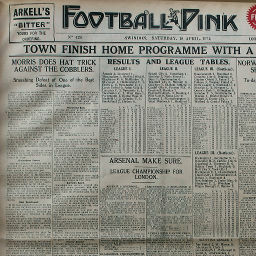 Click to view a newspaper report of Swindon's 1-4 defeat at Northampton Town in the 1931-1932 season. 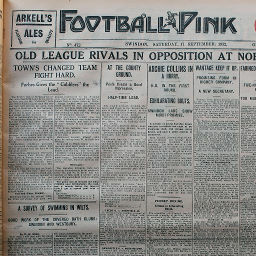 Click to view a newspaper report of Swindon's 0-6 defeat at Northampton Town in the 1932-1933 season. Saturday, January 28, 1933 HATS OFF TO SWINDON'S RESERVE PLAYERS! 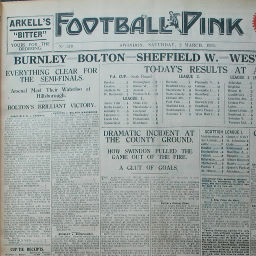 Click to view a newspaper report of Swindon's 2-1 win against Northampton Town in the 1932-1933 season. Click to view a newspaper report of Swindon's 2-4 defeat at Northampton Town in the 1934-1935 season. 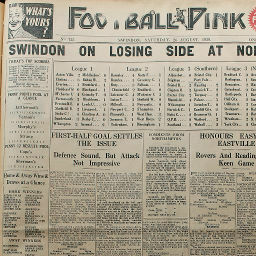 Click to view a newspaper report of Swindon's 5-3 win against Northampton Town in the 1934-1935 season. 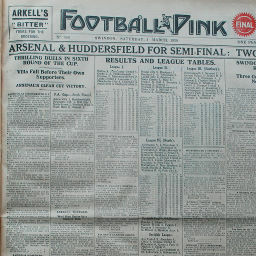 Click to view a newspaper report of Swindon's 3-1 win against Northampton Town in the 1935-1936 season. 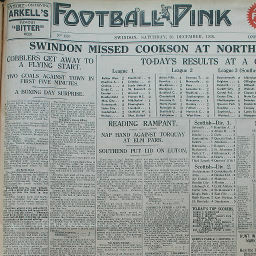 Click to view a newspaper report of Swindon's 0-0 draw at Northampton Town in the 1935-1936 season. 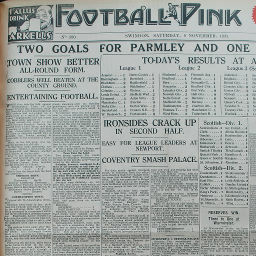 Click to view a newspaper report of Swindon's 2-0 win against Northampton Town in the 1936-1937 season. 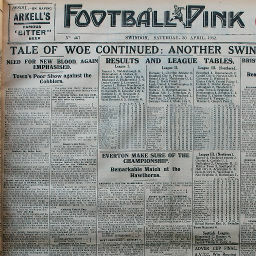 Click to view a newspaper report of Swindon's 0-4 defeat at Northampton Town in the 1936-1937 season. 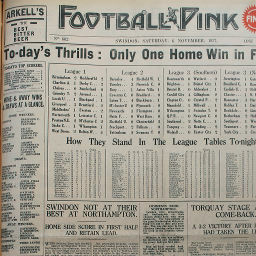 Click to view a newspaper report of Swindon's 0-1 defeat at Northampton Town in the 1937-1938 season. 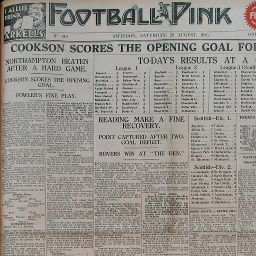 Click to view a newspaper report of Swindon's 1-0 win against Northampton Town in the 1937-1938 season. 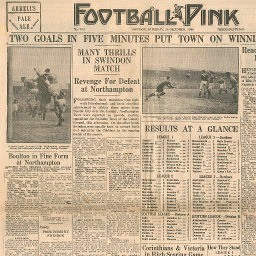 Click to view a newspaper report of Swindon's 0-1 defeat at Northampton Town in the 1939-1940 season. Click to view a newspaper report of Swindon's 1-4 defeat at Northampton Town in the 1946-1947 season. 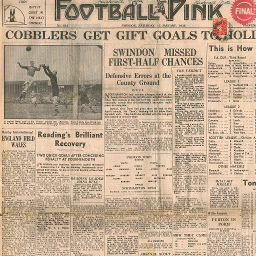 Click to view a newspaper report of Swindon's 3-1 win against Northampton Town in the 1946-1947 season. Click to view a newspaper report of Swindon's 0-0 draw against Northampton Town in the 1947-1948 season. 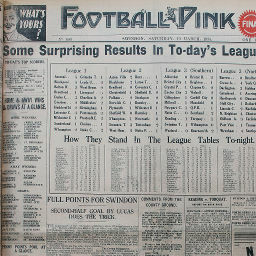 Click to view a newspaper report of Swindon's 1-0 win at Northampton Town in the 1948-1949 season. 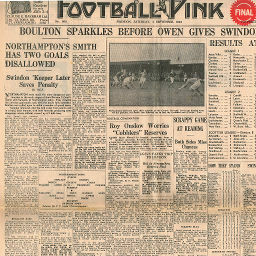 Click to view a newspaper report of Swindon's 2-2 draw against Northampton Town in the 1948-1949 season. 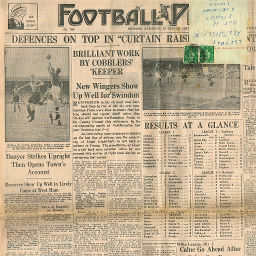 Click to view a newspaper report of Swindon's 6-1 win against Northampton Town in the 1949-1950 season. 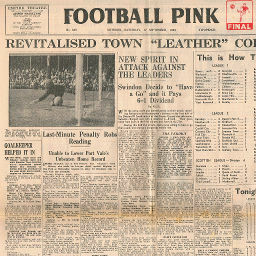 Click to view a newspaper report of Swindon's 1-0 win at Northampton Town in the 1949-1950 season. 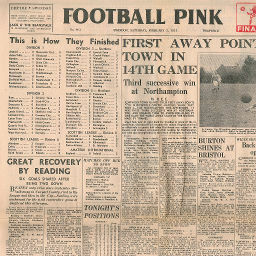 Click to view a newspaper report of Swindon's 1-0 win against Northampton Town in the 1950-1951 season. 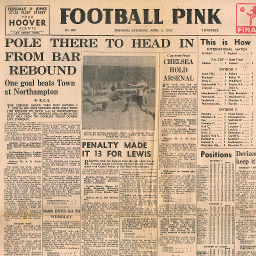 Click to view a newspaper report of Swindon's 2-1 win at Northampton Town in the 1950-1951 season. 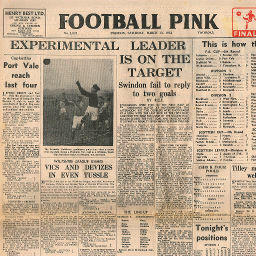 Click to view a newspaper report of Swindon's 1-1 draw against Northampton Town in the 1951-1952 season. 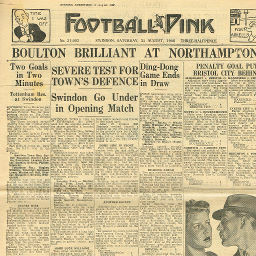 Click to view a newspaper report of Swindon's 0-1 defeat at Northampton Town in the 1951-1952 season. 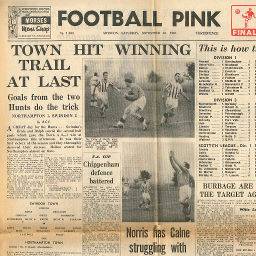 Click to view a newspaper report of Swindon's 2-0 win against Northampton Town in the 1952-1953 season. 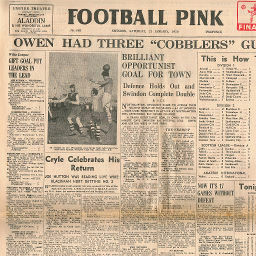 Saturday, April 11, 1953 HOODOO PERSISTS FOR "COBBLERS"
Click to view a newspaper report of Swindon's 3-0 win against Northampton Town in the 1952-1953 season. 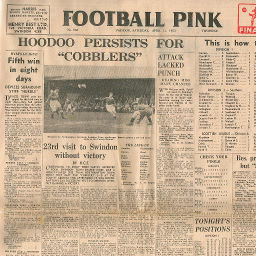 Click to view a newspaper report of Swindon's 0-2 defeat at Northampton Town in the 1953-1954 season. Click to view a newspaper report of Swindon's 0-1 defeat against Northampton Town in the 1954-1955 season. 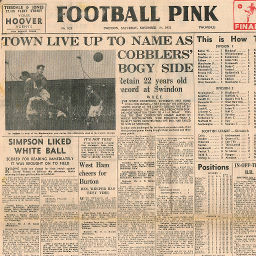 Click to view a newspaper report of Swindon's 0-1 defeat at Northampton Town in the 1954-1955 season. 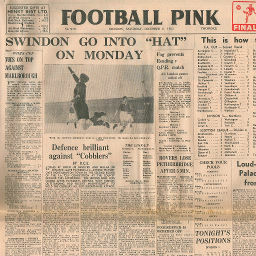 Click to view a newspaper report of Swindon's 5-1 win against Northampton Town in the 1957-1958 season. 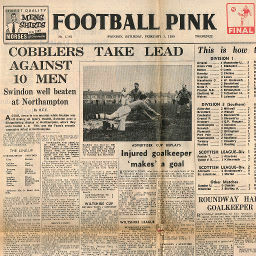 Click to view a newspaper report of Swindon's 0-3 defeat at Northampton Town in the 1957-1958 season. 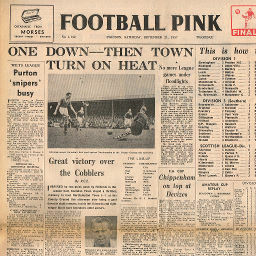 Click to view a newspaper report of Swindon's 2-1 win at Northampton Town in the 1961-1962 season. 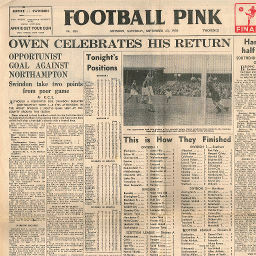 Click to view a newspaper report of Swindon's 2-2 draw against Northampton Town in the 1961-1962 season. 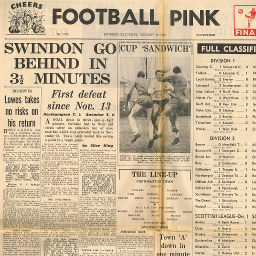 Click to view a newspaper report of Swindon's 2-3 defeat against Northampton Town in the 1962-1963 season. 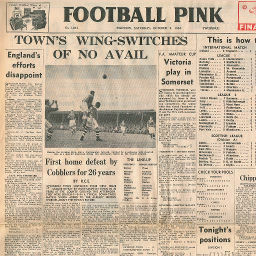 Click to view a newspaper report of Swindon's 0-4 defeat at Northampton Town in the 1963-1964 season. 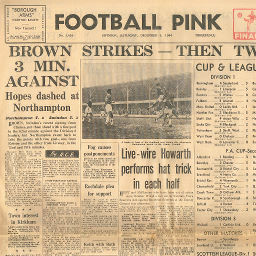 Click to view a newspaper report of Swindon's 1-2 defeat at Northampton Town in the 1964-1965 season. 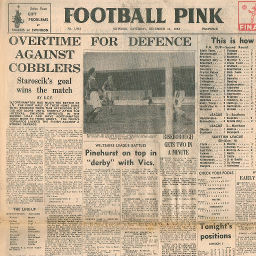 Click to view a newspaper report of Swindon's 2-3 defeat against Northampton Town in the 1966-1967 season. 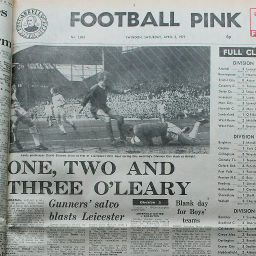 Click to view a newspaper report of Swindon's 4-0 win against Northampton Town in the 1967-1968 season. 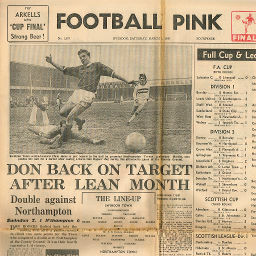 Click to view a newspaper report of Swindon's 0-2 defeat at Northampton Town in the 1967-1968 season. 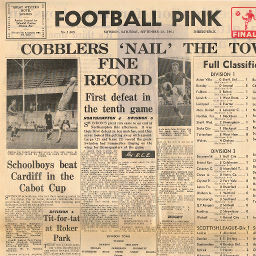 Click to view a newspaper report of Swindon's 1-0 win against Northampton Town in the 1968-1969 season. 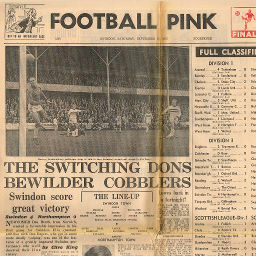 Click to view a newspaper report of Swindon's 5-1 win against Northampton Town in the 1976-1977 season. 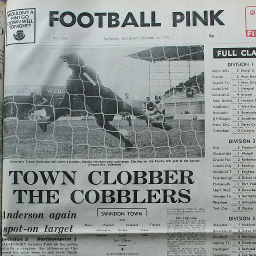 Click to view a newspaper report of Swindon's 1-1 draw at Northampton Town in the 1976-1977 season. 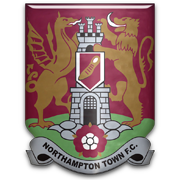 Northampton Town win 4-3 on aggregate.